The iPhone panoramic photography feature can produce amazing images if used with care. If it is a process you would like to explore further, you should practice test it in with a range of situations and subjects. Before you start, you need to consider where the light is coming from to avoid lens flare. You should also decide what your main subject will be and where it will appear in the final composition. If there are rapidly moving subjects in the scene, these may appear squashed or stretched so you may need to wait until they have passed before you start the shot. While natural scenes containing distant buildings, trees and countryside can stitch together reasonably well, modern buildings or interiors shot from closeup can cause problems. For natural scenes, open the camera app, switch to the ‘Pano’ option and you will see a horizontal bar with a large arrow on it. The phone detects the angle you are pointing it in and the arrow tells you if you are tilting it up or down. When you click the shutter button, you then rotate the phone while trying to keep the large arrow on the line in the middle of the bar. If you deviate too far from the line, the camera won’t be able to create a smoothly stitched image. Once complete, press the shutter button again to finish the panorama. 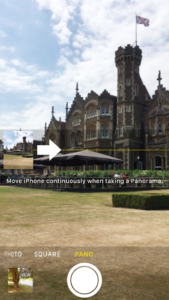 The phone will then process the data and show you a finished panoramic image. These can be very large files compared to standard images and will rapidly use up space on your device. Subjects containing strong lines close to the camera may challenge the cameras software and there may be issues where lines don’t stitch together very well. You may need to change the way you hold and rotate the phone to reduce this. Rather than holding the phone out and rotating around your hips, you could try rotating the camera around itself and the centre of the phone becomes the point of rotation, this is known as its ‘nodal point’. This is harder than it sounds. For serious panoramic photographers, there are special camera supports which rotate the camera around the nodal point. Panoramic photography is just one part of my short iPhone photography workshop. If you would like a mobile phone photography workshop for your course, company or for personal development, do let me know.